This was another impulse-buy during the Perfume & Makeup Exhibit at Mishref Fair Grounds back in October-November. I had attended a wedding earlier that month, and at the behest of all the females in my life, had employed the services of a Makeup Artist. Apparently, my makeup application is too “light” for formal events. The Makeup Artist caked and baked the life out of my face until I was virtually unrecognizable. It was a whole process and it took hours upon hours (and here I thought I took forever). The only fun part for me about the whole ordeal was looking over her kit; she had everything from Chanel to Lime Crime and Colourpop, lots of MAC, and so much more (I love snooping through people’s makeup collection)! With that being said, I was not impressed with the end result, seeing as how she made me look like your typical friendly neighborhood Drag Queen which led to me feeling awkward and uncomfortable throughout the entire wedding, but hey, at least all the females in my life approve (more is more… in Kuwait). As a final step, she took out this huge can of Setting Spray (it was so huge, at first I legit thought it was Hair Spray) and drenched my face in it. After the wedding was over, I passed out face-down on my pillow around 3 in the morning (sue me) but when I woke up, my makeup was not only intact but virtually untouched (aside from the sides of my nose er, nostrils which I kept wiping with a tissue eventually removing all traces of foundation from it because it was so cold in the Wedding Hall). Fast-forward to a month later, I spotted the iconic Blue Can of Fixing Spray at the Kryolan Booth and flirted with the idea of purchasing it but it cost a lot so I decided against it and was about to walk away when I saw something I’d been dying to get my hands on for years, a Color Switch from the brand Vera Mona, laying all nonchalant on the shelving unit. I figure since I was going to buy the Vera Mona Color Switch, might as well pick up the Kryolan Fixing Spray as well and that settled that. I’ve never actually purchased anything from Kyrolan before but I do remember lusting after several of their products way back in the day, when I was slightly more makeup-obsessed and felt the need to purchase every single makeup product and makeup-related product in existence, regardless of practicality (for example Spirit Gum… as if I’d have any use for that). I never got the chance to though, because we only got the mainstream stuff (products that were sure to sell) and even then, not complete collections. Thankfully, now that Makeup and Beauty Products have taken over the world (everyone is obsessed, world-over) we’re getting access to some of the more unusual products out on the market, even in our little ol’ Kuwait! Normally, I’m quite particular when it comes to certain products (I don’t trust just any brand…) but like I said, I’ve heard of Kryolan before and it’s a very reputable brand. Apparently, it’s a German brand (superior quality) and has been around for a long time. In fact, Kryolan have been supplying Film, Theater, and Television Industries for over 70 years. Their tagline is “Kryolan. It’s a science.” This particular Fixing Spray is a best-seller (and is usually sold out both online and in-store). I’ve taken a photo of it side-by-side with a can of Batiste Dry Shampoo and a MAC Fix+ Spray so you can gauge the difference in size. This stuff (400ml) is huge! Kryolan Fixing Spray normally retails for KD22/950 but since I purchased it during the Perfume & Makeup Exhibition, I got a little discount. I’m not quite sure when and if I’ll ever have the need to use a Fixing Spray (I actually prefer the look of slightly-worn-off, less-intense-then-when-you-first-applied-it makeup). I guess I could experiment with this stuff during the insanely humid weather we’ve been having these past few days… even though the idea of wearing face makeup during sweaty weather makes me cringe. I’ve never tried anything from Vera Mona before either but I’ve been dying to get my hands on a Color Switch (from any brand really) for years. At one point, I was even debating purchasing a Shoe Shine Sponge and using it as a Color Switch. It’s a nice alternative to using liquid brush cleansers (that take a full day to dry). You just rub your brush on this stuff and your brush is ready to use, instantly. Truthfully, it’s not really necessary. I mean, when I need to switch from one eyeshadow to the next, I just wipe my brush on the back of my hand. With that being said, some of the darker colors tend to stain (refuse to wash off my hands with just water and soap, I actually need to break out my makeup remover and wipe it off) which can be a bit time-consuming when you’re constantly late (as I am). Also, the more shimmery eyeshadows can be a bit of a pain to remove completely (shimmer gets everywhere). Hopefully, that’s where this stuff will come in handy. As you can see, the Vera Mona Color Switch Duo comes in a cute tin with a lid that you can either remove completely or pop on, at the bottom. I believe you can purchase Color Switch in a pretty purple tin, as well. I went with the Color Switch Duo (white sponge wedged in the hole in the middle) as opposed to the original Color Switch (all black, no hole) because it was only a few Kuwaiti Dinars more. I figure since I was paying good money regardless, might as well get the more expensive one. Apparently, the little white sponge is meant for you to dampen the brush (after you soak the white sponge in water), for a wet-brush application (more pigmented eyeshadow, etc…). That could be a time-saver as well. With that being said, you have to clean the white sponge after every application. Both sponges are easily cleaned with warm water and soap. Here’s a close-up of the Color Switch Duo with and without the white sponge in the middle. In all honesty, I could see this being particularly useful with my MAC 224 (fluffy, tapered, blending brush) because I use that brush for everything from diffusing harsh lines of eyeshadow to applying my highlight and even the occasional nose contour, which means I’m constantly wiping it on the back of my hand before switching to a different color or product. Even if it wasn’t particularly useful, I’ve had my eye on this baby for quite some time now and at this point really needed to have it, if for the novelty factor alone. 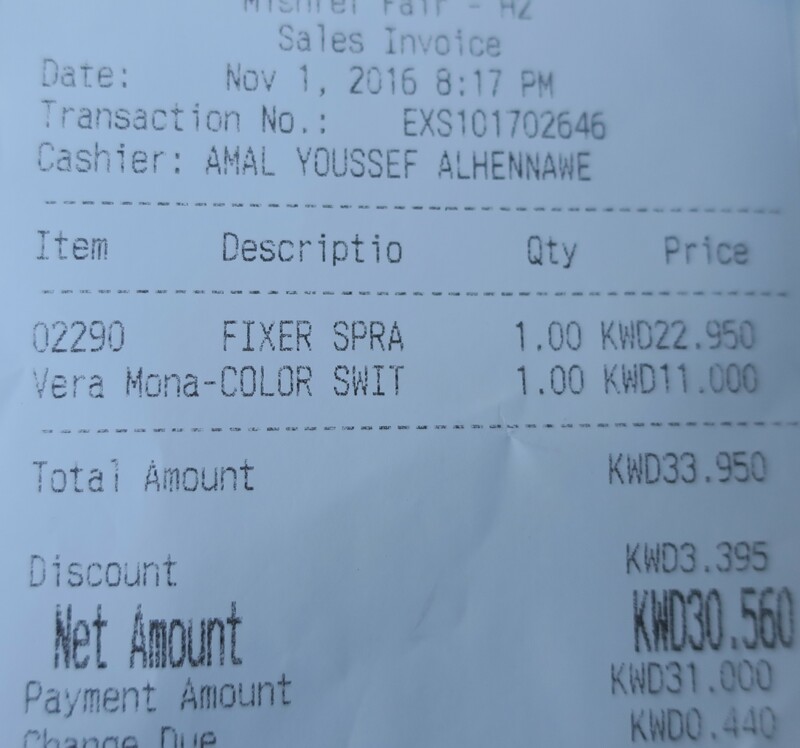 Vera Mona Color Switch Duo retails for KD 11/000 whereas the original Color Switch might retail for somewhere around KD10/000. Overall, I’m pretty pleased that I got these two. I mean, they aren’t exactly fun makeup products but they are makeup-related. Plus, good tools are always handy! In case you are interested, I’m pretty sure I saw a Kryolan branch somewhere in Jabriya (around Pinkberry possibly) or you can just wait until the next Perfume & Makeup Exhibition (which take place twice a year) at Mishref Fair Grounds.